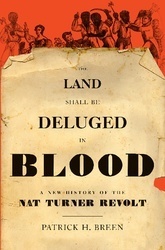 On August 21, 1831, Nat Turner and six men launched the most famous slave revolt in American history. The rebels swept through Southampton County, Virginia, recruiting slaves to their ranks and killing nearly five dozen whites. Although a hastily assembled group of whites soon suppressed the violence, its repercussions were far reaching. In The Land Shall Be Deluged in Blood, Patrick H. Breen explores the terrible choices faced by members of the local black community as they considered joining the rebels. And he reveals how local slaveholders' accounts of the revolt checked the threat to slave property posed by enraged whites. Breen uses the Turner revolt to offer a surprising look at both the power and fragility of slavery. Patrick H. Breen is an assistant professor of history at Providence College. He has contributed to the anthology Warm Ashes: Issues in Southern History at the Dawn of the Twenty-first Century and The Virginia Magazine of History and Biography.